Need more information about booking Home 7267172 ? Villa Rosetto, no doubt makes a divine home base for your vacation in Madeira. 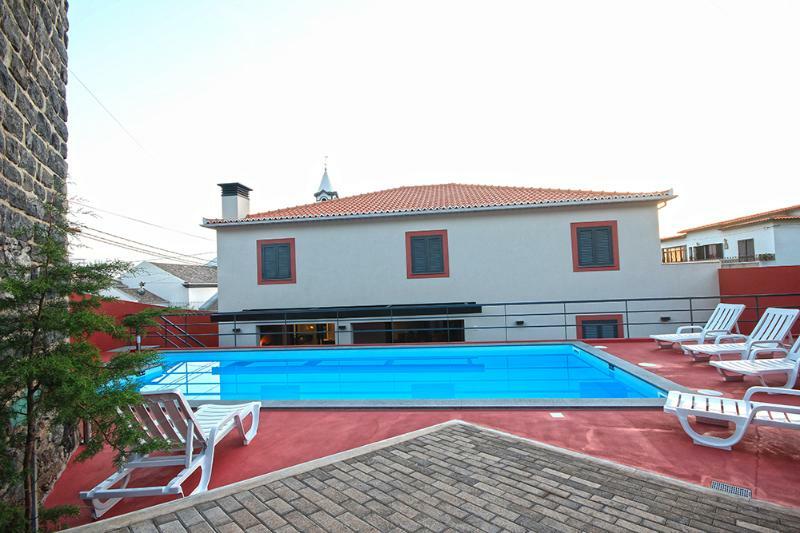 Close to many historical sites and vineyards, this traditional villa is part of the beautiful Arco da Calheta village, where quiet cafes and restaurants line the small street at the center of town. The well-tended gardens have a beautiful swimming pool. There is a summer kitchen with a BBQ and outside dining and lounge area with comfortable furniture. The villa also includes Wi-Fi access. The entire house has been decorated with much love and care to ensure total comfort. The kitchen is a chef’s delight that is fully equipped. The living area is very cozy. Six fabulous bedrooms, all with en-suit bathrooms, accommodate up to 12 guests at Villa Rosetto. Children are welcome. Fine linens and top quality accoutrements help provide a tranquil night of sleep. Villa Rosetto is a perfect destination for a family with older children or groups. The property is located in a quiet residential area with wonderful hiking and bike riding options within easy reach. This area also offers countless opportunities to experience the long and diverse Madeira Nature. Feel relaxed and refreshed amid the sweet fragrance of lavender on the breeze. You can get in touch with Holiday Rental Madeira (the owner) through the contact form on this page. Send Holiday Rental Madeira (the owner) an email through the contact form on this page. Alternatively, if there’s a phone number on this page, you can call them. How do I contact Holiday Rental Madeira (the owner)? If you’ve already booked, go to Manage your holiday booking to view Holiday Rental Madeira the owner's contact details or send them a message. Or send Holiday Rental Madeira (the owner) an enquiry through the Contact the owner/manager form if you’d like a quote or more info first. When you pay online through the Book your stay form, a booking request is sent to Holiday Rental Madeira (the owner). You’ll find out within 24 hours whether they’ve accepted - no money will leave your account before then. You can also request a quote from Holiday Rental Madeira (the owner) through the contact form. The owner will email you the total cost for your dates and a link to book and pay online. Use the Book your stay form to pay provisionally online. You can pay by credit/debit card or PayPal. Holiday Rental Madeira (the owner) will have 24 hours to accept the booking and no money will leave your account before then. Why can't I call Holiday Rental Madeira (the owner) before booking? You’ll need to contact Holiday Rental Madeira (the owner) to do this. Send them a message in Manage your holiday booking or through the contact form on this page. You can request to change the dates or number of people on your booking via the Manage your holiday booking page. To change your holiday dates use the Edit booking button. If you need to change the number of guests staying then send Holiday Rental Madeira (the owner) a message. If Holiday Rental Madeira (the owner) agrees, they’ll send you a revised quote outlining the changes. You can review and accept/decline this from the Manage your holiday booking page. You’ll have 48 hours to take action before the revised quote expires.